Hi! I hope you are enjoying all the glitter and shine on the blog this week!!! I know I had fun playing with some stickles and glimmer mist. I looooove glimmer mist, but tend to forget all about it in times. But now, I have sparkled up my center piece real good! Well, the glimmer mist doesn’t come through the photo, but believe me, it’s shimmering! I added stickles on the balloons from the Birthdays and Balloons set and covered it with a coat of glossy accent. Hope you want to participate in our glittery challenge this week. All info can be found HERE!!! This week's sparkle challenge is right up my aisle! I *love* playing with glitter! I couldn't resist using my Mini Jar again...I stamped the jar and lid on BoBunny designer papers and cut them out. This time I did not use acetate at all for my jar. 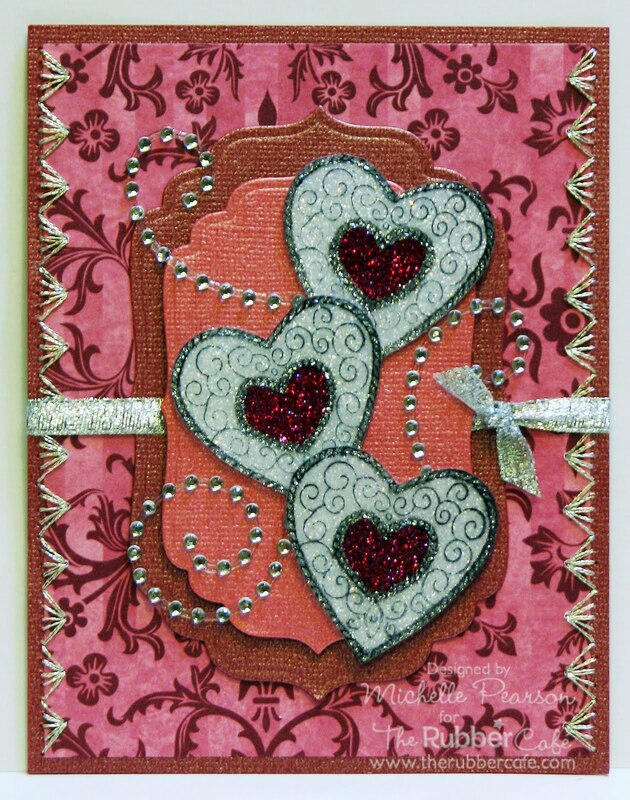 I stamped the Heart Trio and then covered them with glue and glitter. This card I made as a flat panel card. The jar lid opens to show the I Love You message, and you can write a personal message on the inside of the jar flap. to close the lid, simply tuck it under the Happy Valentine's Sentiment. We hope you join us on this challenge!! Fun challenge this week here at The Rubber Cafe. Show us some Glitter and Bling!!! I totally blinged out my card today. (Well alot of bling for me!!!) I used Grater Floral for my card today and colored with my copics. Then I added Crystal Stickles everywhere as you can see in the second picture. I also added a ton of shiny crystals on my border. 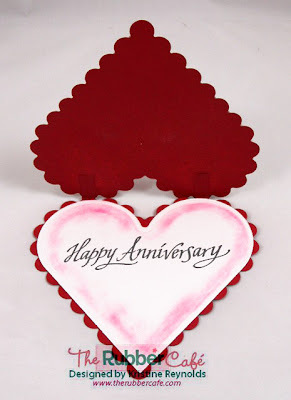 I kept things simple by cutting my image out with a Deckled Rectangle from Spellbinders and using only one kind of DP. Very clean and simple for me. So come and join us with our new weekly challenges. A cool prize is up for grabs to one random player and we would LOVE to see what you create with your Glitter and Bling!!! Thanks so much for taking a look today. Have a great weekend. This is the second week of our weekly challenges. This weeks challenge is Sparkle & Glitter. Ever since my daughter was little and I would ask her opinion on a card that I wasn't happy with and she would tell me to add glitter! I have to admit...it did always improve the card! I kept my sample card simple so that the focus would be on the sparkly image. Here's a close up of that sparkly cupcake. I hope you'll join us for the sparkle and glitter challenge this week! It's been so busy here at The Rubber Cafe. There have been challenges and winners and cards...OH MY!! If you follow us on Facebook, you see a sneak peek of our newest stamps. Challenges are now happening on a weekly basis. You don’t need to be a design team member to participate in our weekly challenges. By participating in the challenges, you could be the latest Rubber Café winner. Check out this post for more information. This week the challenge was a shaped card…any shape but square or rectangle. I really love what the others have done with the circle…I couldn’t help but do the same. I cut my circle out using the Cricut. 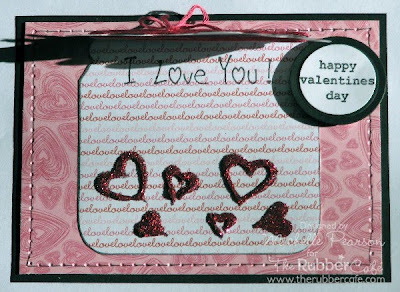 I’ve also used spellbinders labels 14 for the Heart Strings. 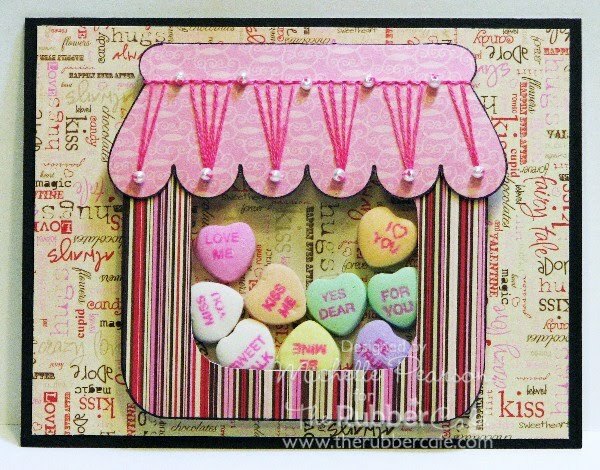 On the inside I added a punched heart and stamped the Happy Valentine’s Day from the Bubblegum Machine set. Remember, if you post for this challenge to use TRCC1 in your keywords. Thanks for stopping by. Thank you for coming back, I got it all straighted out with the computer problems (we've come to an understanding with eachother of sorts) and now I can show you the shaped card I made for this weeks challenge. Please join us in our weekly challenges they're lots of fun and you get a chance to win a prize. Click on my link above to read the rules, and come join us. Again I appreciate your patience and hope it was worth the wait. I just wanted to pop on and let you know that I didn't forget about you. Aren't the challenges fun and the samples GREAT??!! Show the girls some love and PLEASE share your talent with us and have a chance to win a prize. I made a card base with my laced circles nesties. Stamps used are Umbrella and Danced in the rain. We hope you want to play with us!!! All info about the challenge can be found HERE. Hi Everyone. Can't believe Sunday is all ready here! 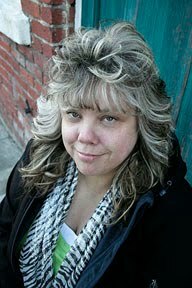 Today is normally Michelle's day to post but unfortunately she had a death in the family and was unable to get a card made. Our best wishes are with Michelle! 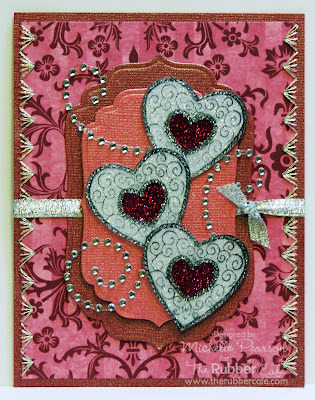 Luckily, I had a card I made a couple of weeks ago that fits the shaped card challenge that we are having this week. Did you hear that we are starting weekly challenges here? That's right, every week we will be hosting a challenge for all you challenge junkies. And....we will draw a winner from the random participants to win a gift certificate from The Rubber Cafe Store! You can learn all about the challenge here. I started this card with a die cut fish bowl card from Creative Cuts & More and then created this fun fish scene using "Fishing for Details". We would love to see your shaped card this week. You have till Wednesday to enter! WHO WON THE GOLDEN TICKET! Stay tuned to our blog sign up and follow us we are always doing fun things on here ... You never know you may be our next winner. We have several very talented designers that post here everyday .. Challenges on Thursdays , tutorials and lots of other great stuff . Have you seen this post?? The Rubber Cafe is now having a weekly challenge and we would love for all of you to play along with us. This weeks challenge is to make a shaped card. Anything other than a square so I went easy and made mine round. Now I knew which image I wanted to use this week and this one is on the larger side so it took up the entire card which is why I went with a Clean and Simple look. No room for Designer Paper or any embellies. 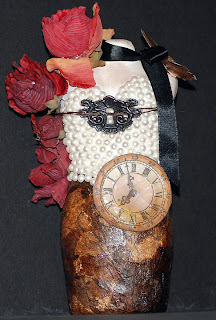 The image I used today is called Hand Picked Floral. I stamped onto white cardstock and colored with copics. Then I added a bit of shimmer with my spica pen and my glaze pen. Both circles were cut out with my circle nesties. So we would love for you to play along. Just pull out those shapes and get creative!!! Then head back to this post and leave a link in mr linky!!! Cant wait to see what you create!!! Have fun!!! Welcome to The Rubber Cafe Design Team Blog! It's special because today we are going to start hosting weekly challenges for all you challenge junkies out there! We would love it if you would join us each week for our weekly challenges. Each week we will randomly draw a winner out of the projects that are entered and the winner will win a prize. This weeks prize is a $5 gift certificate to the Rubber Cafe store. For our very first challenge we decided it would be fun to do Shaped Cards. 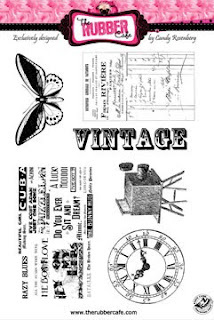 By shaped cards we mean anything other than a square or a rectangle. Check back each day this week so you can see what the rest of the design team comes up with for this weeks challenge. And...if you join us, be sure and link your card below. As promised, today we've posted the tutorial for the cards you've been seeing this week on our blog. But first...a quick announcement. 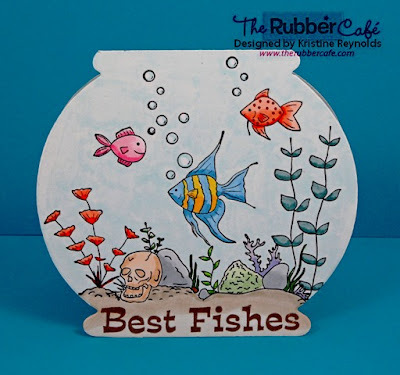 This week The Rubber Cafe will be providing you with fun wonderful oppertunities to craft and you may even win a little something at the same time. Starting tomorrow, and the following Thrusdays to come, we'll be hosting a challange. Rules and details regarding the challenges will be posted on Thursday and the following Wednesday a name will be drawn for the prize. Don't forget to check back each day to view new samples. Cardstock 8 1/2" x 5 1/2"
You'll start by scoring at 2 1/8" and 4 1/4" on the 8 1/2" side of the paper. Don't fold just yet. Add decorative paper to your first scored section if desired by adding adhesive to 3 sides only. This will prevent the paper from sticking to the center point of your card. A quick tip to getting your paper to match up straight, line up your cardstock against a straight edge and add your decoative paper pusing both against the straight edge at the same time. Your stack is as follows...A plate, B plate, Paper, Template, C plate. Line the C plate up against the first score line, making sure not to go over the line. By leaving the die half exposed, you will only cut the one side. Run your sandwich through the cuttlebug. Note: if you have the Big Shot you can do this with individule plates but not with tabbed plates. Fold back the die cut panel leaving the die cut exposed. Fold the second score line forward to form the "Z" pattern in your card. Decorate and embellish as desired. Don't forget to check back tomorrow and see what we have in store for you. Our design team loves to hear from you, please leave them a comment and let them know they're loved. I went rummaging through my stash today and found some pet themed paper I was saving for a rainy day. Then I remembered I do live in Vancouver BC so its always raining so why not use it today. I then created this unconventional birthday card..... hope you enjoy. This is my first attempt at this type of folded card but i'm pretty happy with the results. Do you have pictures of a "K" or swing card that you made?? Do you have any other fun folding cards?? Please leave a comment and share a link. 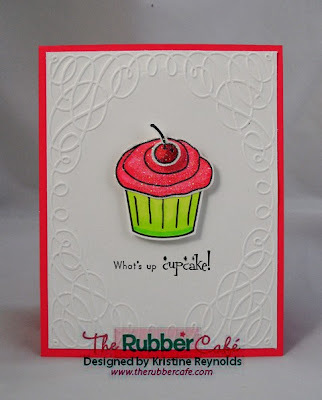 The Rubber Cafe stamps used on this card "Birthdays and Balloons" and sentiment from "Hey Cupcake"
Hi folks! Hope you are having a good start of the new week!!! I have not one but two cards today with a new (to me) fun fold. Lisa will tell you all about this fold on Wednesday!!! Anyway, it was so fun to make, that I made two while at it! 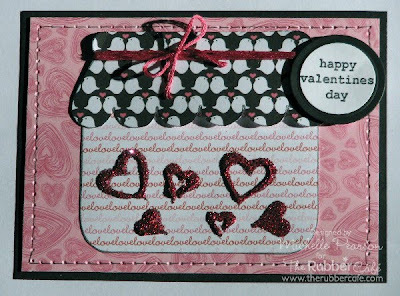 Second, a red Valentines card with the super cute labradore stamp from the Labrador Love set. Well....I've started sorting images laying on my desk by company....and in my bin for The Rubber Cafe I had these 3 heart ornaments leftover from my holiday card making spree with the Ornamental Holiday set. 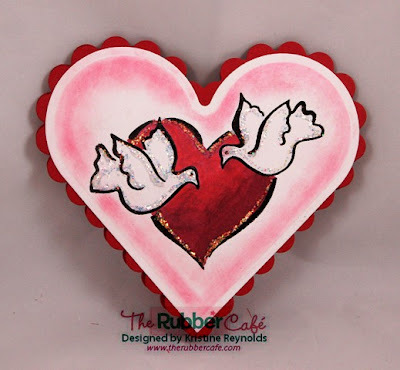 These hearts are perfect for Valentine's Day or an anniversary or wedding with a little modification. I stamped the images on acetate and snipped off the ornament strings...now I have 3 beautifully detailed hearts. I did them up with the glitter and acetate technique with silver, pearl and french kiss glitters. I finished off my card with paper embroidery and silver embroidery floss. Happy Saturday!! I was excited to pull out a fun and happy set from last year called Birthdays and Balloons!! I have always enjoyed coloring this little guy and I needed a card for a little boys birthday so this is what I came up with. The image was cut out with circle nesties and the balloons were hand cut out of designer paper. I colored this little cutie with copics and added some bakery twine to the balloons. I kept this fairly simple because the little boy is only 5!! Thanks so much for taking a peek today. Hope you enjoy your weekend!!! Wow...Candy sure did a fabulous job with those stamps. Don't forget to show her a big round of applause by leaving a comment. 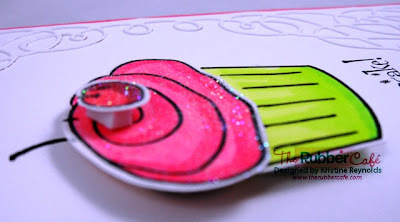 If you haven't seen the new stamps, check out the peek that Candy did for us on Wednesday when she hijacked the blog. In the meantime, don't forget to check out The Rubber Cafe for so many other fun stamps, like Labrador Love or Birthdays and Balloons. The bone from Birthdays and Balloons is the perfect size to use for making quick and cute patterned paper. Don't forget to check out the background stamps. They can change an ordinary blank piece of cardstock into eye catching pazzazz. Add a little color using copic colors, and then add a little glitter or glossy accents to spice up your color. There are so many great stamps and products at The Rubber Cafe...it's hard to decide what to buy next. Hope you enjoyed todays card. The design team has worked very hard to bring you wonderful and creative cards. Let them know they're loved by leaving a comment. ***Post Edit: For instructions on this card check out my upcoming post this Wednesday (Jan 19th). A link will be available here once the post is available. I hope your week is going well! I have a card to brighten up your day a little! I just love these little turtles from The Rubber Cafe. Today's card is a bright, fun little card that would be perfect for the music lover in your life. You can check out all the different Stella and Angus images here. I hope you are feeling inspired to create something for someone you love today! The Rubber Cafe Blog Has Been Hi Jacked! 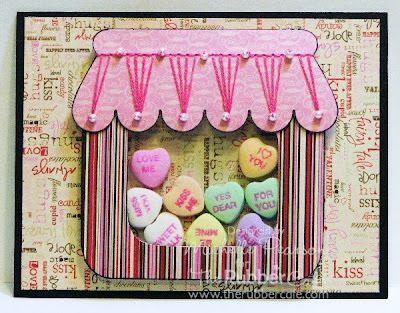 Ok fellow stampers, this is Candy Rosenberg and I have officially hijacked this blog! Don't tell Melissa! Luckily I live just far enough away that she will not be able to catch me by the time she sees this in the morning...so ssshhh!! 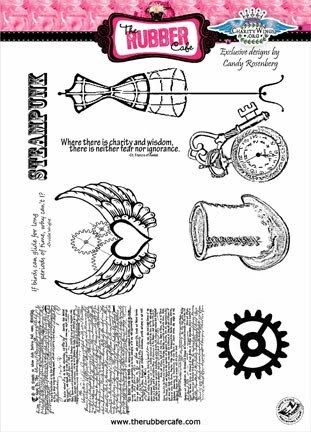 Recently I was asked to design a "Steampunk" themed set of stamps for the benefit of Charity Wings, a non profit organization that supports crafter's and artists like you! I could not have been more thrilled to be a part of this! So without any further ado...let's reveal this baby! But wait, I have to share these great projects that Melissa made using both stamp sets...I already have dibs on the beautiful shadowbox so don't even try to bribe her, it wont work! And for those that know me, know my love of mannequins and dress forms, so she was brave enough to jump in with both feet and alter a mannequin. DRUM ROLL PLEASE.....................And here she! And remember these sets are ready to purchase in the store...so help support Charity Wings and get your set today! Are you wondering what "Steampunk" is? I am asked this alot. So let me explain. If you were standing in the Victorian era and looking to the future, this is what your future would have looked like; industrial steam machines, mad scientists, hot air balloons, gears, corsets (more on that one another day) and more. Ladies, you should have received an email already, so be sure to give Melissa your mailing address! Thank you to everyone for being a part of our Facebook giveaway! Keep an eye out here on the blog and Facebook for more giveaways and a final reveal to come! Thank you to everyone; Elena at Charity Wings, Melissa at The Rubber Cafe and my current and new friends and family for all the support and encouragement. These sets are dedicated to each of you! As soon as I saw these jar images, I knew I needed to fill it with lots of fun things. In my previous cards, you've seen fruit and love bugs in my jars! 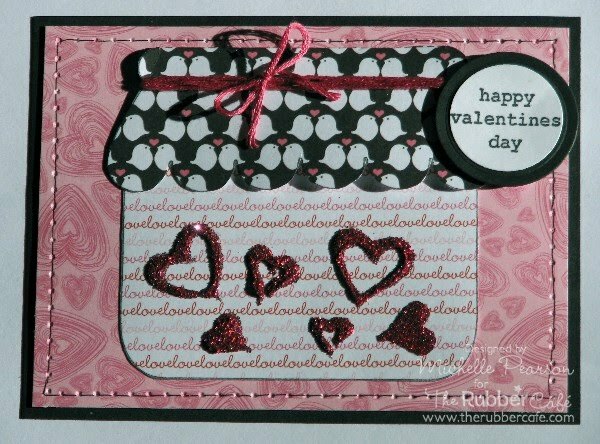 Today it's a shakerbox card with valentine candies in it! I had some thick foam board that I've had around here for YEARS....and since I don't toss stuff...and knew exactly where it was in my piles'o stuff.....I put it to good use here! I stamped the image on the foam board so I had an idea of how large a window I wanted to cut in it. I added some paper embroidery to the lid and a few beads for fun. I'd love to see what you are filling your jars up with! Be sure to friend The Rubber Cafe's blog and Facebook pages....there are new stamps coming real soon...and Melissa is the giving sort!!! Good Luck to you!! Well my inspiration comes from many different places and at different times. Being creative for me involves the emotion conjured up behind either a color challenge, sketch challenge or the many goodies available. My mood plays a big part of it. Some days a color challenge gets me going and other days it will be a sketch. So I would have to say that my inspiration is an emotional drive to create and be creative. With that in mind I set out this week to create a Valentine Card for you to see. I pulled out my much loved set called Sweet Kitty. I stamped my image with memento black ink and colored with my copics. My dp is MME Be Loved from last year. 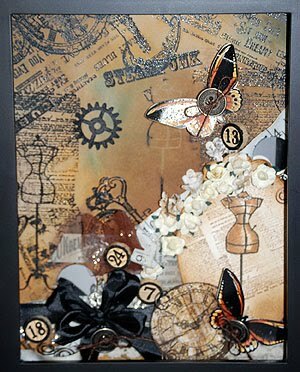 I used circle nesties and scalloped circle nesties to cut out my image and back circle panel. Then I finished things off with a pretty big red bow and a few tiny red crystals. 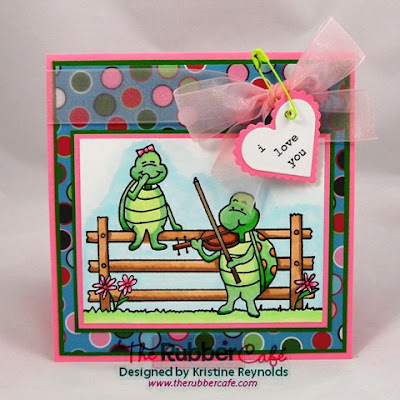 Melissa has a fabulous selection of valentine images for you to drool over!! Head on over to The Rubber Cafe and check them out. Thanks so much for stopping by today. I loved sharing my inspiration with you!! !